Open surgery used to be the gold standard treatment for patients with shoulder instability in the past. For many years however, keyhole surgery (also known as arthroscopic surgery) has been used successfully to help patients with shoulder instability. Minimally invasive surgery uses just tiny stab incisions. This causes less tissue damage than open surgery though a large incision and allows patients to recover much quicker. Trauma: A violent inury like a heavy fall or sports injuries can result in a dislocated shoulder. When the shoulder dislocates, the stabilising structures in the shoulder (labrum, ligaments, rotator cuff, capsule) can get damaged. In younger patients a dislocation typically results in a tear of the labrum. In older patients however, the dislocation more commonly causes tears of the rotator cuff tendons. Sometimes a dislocation can also cause fractures of the bones. Soft Tissue Hyperlaxity: Everyone is born with soft tissues that are either more or less flexible. This results in some of us being rather stiff-jointed (those who can hardly reach to their toes), while others are very flexible and bendy (contortionists are an extreme example). While flexible, lax soft tissues can have some advantages in daily life, they can also leave joints like the shoulder with a lack of support. This results in an increased risk of dislocations. Some people can even voluntarily dislocate and relocate their shoulders (the sort of party trick that leaves everyone else a bit queasy...). Muscle Patterning: The seemingly simple task of lifting the arm up required the perfect coordination of more than a dozen of muscles or tendons. If the balance of forces between those muscles is disturbed, unopposed muscle forces can pull the shoulder joint out of its socket. Trauma: A lot of patients will make a full recovery with help of Physiotherapy. However, some patients may require surgery to help stabilising the shoulder again. 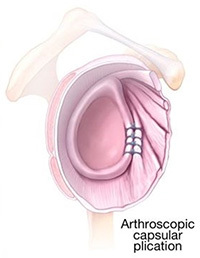 Keyhole surgery is the best way of repairing damage in the shoulder like tears of the labrum or the rotator cuff. Hyperlaxity: Physiotherapy is the main way of helping patients with symptomatic hyperlaxity. This can often be a lengthy process of teaching patients how to be in better control over their shoulder. Most patients do well with Physiotherapy. Rarely is surgery required to tighten up the overly lax joint capsule. While keyhole surgery can work well in the short term, there is a risk that the soft tissues will stretch out again over a period of time, resulting in a recurrence of the instability problems. Muscle Patterning: This requires lengthy treatment by an experienced shoulder Physiotherapist. There is usually no role for surgery. 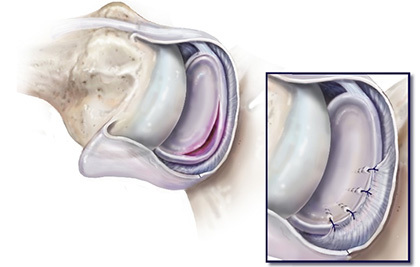 Arthroscopic repair of the labrum (also known as Bankart repair): This is the most common operation performed to help patients with ongoing problems following a traumatic dislocation of the shoulder. Using special instruments and bone anchors, the torn labrum is sutured back to its normal position on the edge of the bony socket so it can heal in its anatomical position. Arthroscopic capsular reefing/plication: This can be considered for patients with hyperlaxity who failed to improve despite a 6-month course of Physiotherapy. Through a few tiny stab incisions and using some specialised instruments the overly lax shoulder capsule is reefed and tightened up to provide better soft tissue support for the unstable shoulder. Arthroscopic rotator cuff repair: For patients who sustained a rotator cuff tear following a shoulder dislocation, keyhole surgery is the best way of repairing the damage. This is ideally carried out fairly soon after the injury to allow for a successful repair. Through a number of tiny stab incisions and using specialised instruments and bone anchors, the torn tendons are reattached to their normal bony insertion point. The procedure is followed by a lengthy course of Physiotherapy. Are you a candidate for keyhole surgery following a shoulder dislocation? Arthroscopic/keyhole surgery can offer several benefits over traditional open surgery: less soft tissue damage, less pain, fewer risks, quicker recovery and quicker return to work. Keep in mind that most patients get better with Physiotherapy alone and surgery should be seen as the treatment of last resort. There are of course some disorders that warrant urgent surgical intervention. An experienced shoulder surgeon will discuss with you, what treatment is most suitable for your problem and work out a treatment plan that best addresses your unique individual circumstances.